When Montblanc gave us a privileged preview of its new Heritage collection in Miami back in October, our gut told us that they had a winner in the salmon-dialled Heritage Pulsograph. Forward three months to SIHH: 36 exhibiting brands and I-don’t-know-how-many-hundreds of new watches later, our opinion is, if anything, stronger than ever. With the Heritage Pulsograph’s immaculately judged balance of good looks, technical content, quality of execution and price, Montblanc has hit the nail on the head. First, let’s talk aesthetics: vintage-inspired watches have been a thing for some years now – and thanks to its head of watches, Davide Cerrato, Montblanc is a shining example of how to do it right. (Cerrato has previous form, as you may know, having harnessed Tudor’s archives to transform it from also-ran to super-cool brand half a decade ago.) 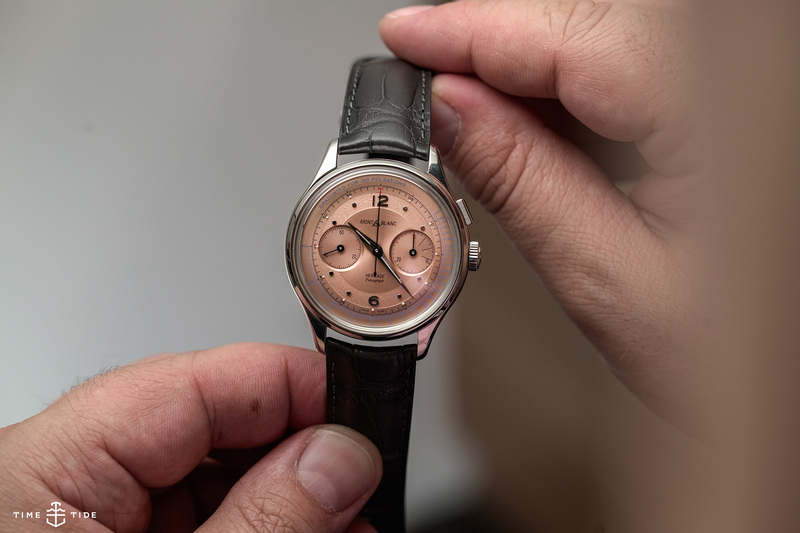 At Montblanc, he has the rich archives of Minerva to draw on – and the Heritage Pulsograph is very similar to a 1940s Minerva monopusher chrono. But it’s no slavish copy. We were able to line up both watches together and, on the new model, the lines of the case and lugs are cleaner, the surfaces flatter, giving the whole watch a more contemporary look and feel. The stop-start-reset pusher sits at 2 o’clock on the case-band, exactly as on the original – and yet it somehow looks more contemporary than a pusher integrated into the crown. The face of the watch is loaded with sophisticated details: sitting under a box-shaped sapphire crystal, the dial is slightly domed, the grained finish of the hour ring makes a nice contrast to the smooth surface, and the hands are curved to follow the shape of the dial. 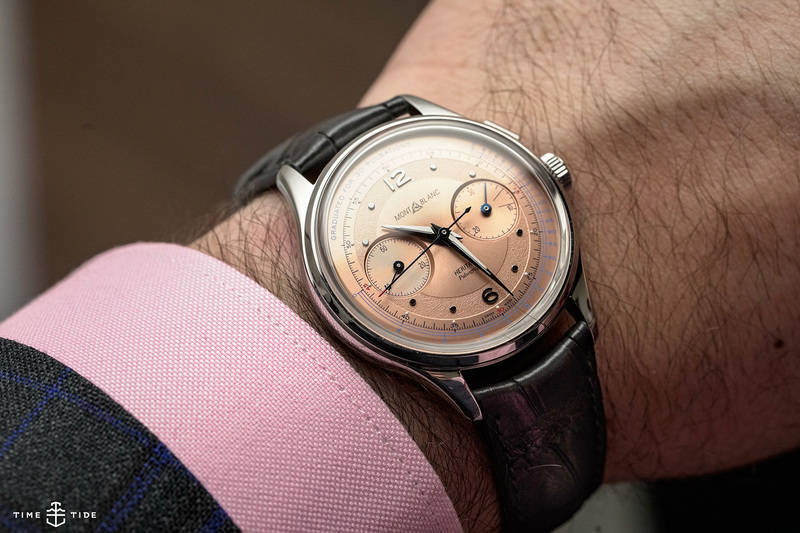 Montblanc’s choice of anthracite rather than black for the applied 6 and 12 numerals, and blue for the pulsometer scale and chronograph hands is a sophisticated touch. Affectionately known as doctor’s watches, due to their historic use by physicians to measure pulse rates, pulsographs became redundant in the later decades of the 20th century and disappeared from watchmaking. That’s until Montblanc reintroduced the complication (and introduced calibre 13.21) as the flagship of its 2014 Heritage Spirit collection – a one-off limited edition. Along with the pulsometer scale on this year’s watch, Montblanc has added another nod to history: markers at 3, 6 and 9 in the minutes sub-dial to recall the old international phone-calling system. Call charges were metered in three-minute intervals, with ‘beeps’ to remind the caller when time was nearly up. So, the front of the Heritage Pulsograph is beautiful. But flip it over and there’s a great big extra treat for the eyes. 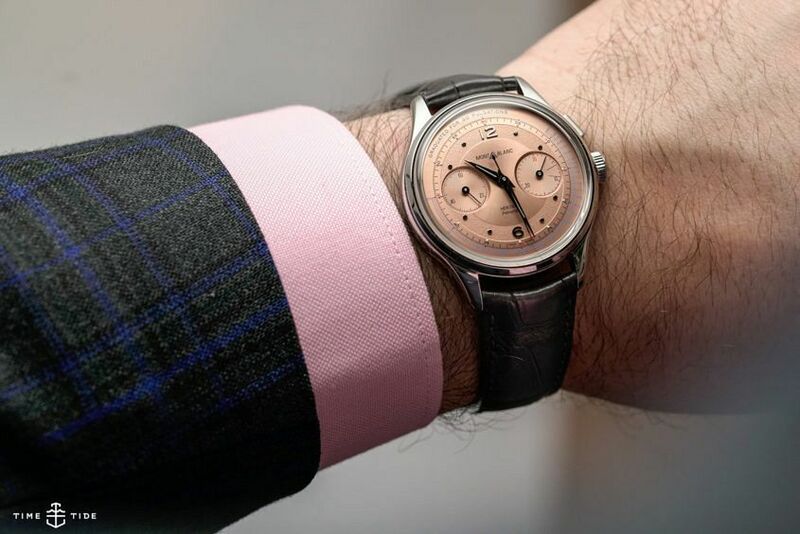 The movement is calibre M13.21, Montblanc’s updated version of Minerva’s justly celebrated chronograph calibre 13.20, which was introduced in 1923. We have previously seen the M13.21 in last year’s limited-edition 1858 Monopusher Chronograph, and the aforementioned 2014 limited-edition. 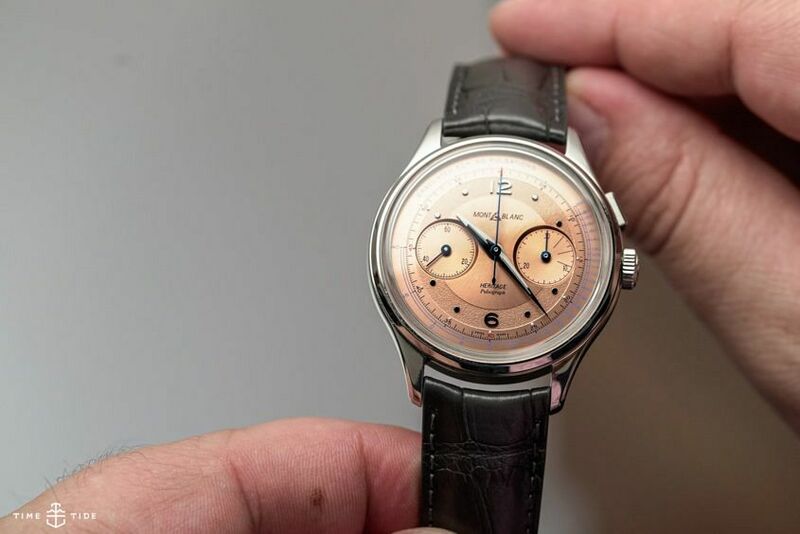 To those who still stubbornly question Montblanc’s legitimacy as a watchmaker (please, people, get with the program), nothing could be better proof than this movement. Like the Minerva original, it’s a manually wound, column-wheel chronograph with a horizontal clutch. Horizontal because it looks so much prettier than a vertical-clutch chronograph. We’re talking really pretty: those curly Minerva bridges and levers are, along with Lange’s chronographs, the loveliest in the business – distinguished here by the Minerva signatures of V-shaped chronograph bridge and “devil’s tail” lever. The plates are chamfered and their surfaces circular-grained; the bridges are decorated with Côtes de Genève; the levers are straight-grained; the countersinks are mirror-polished. 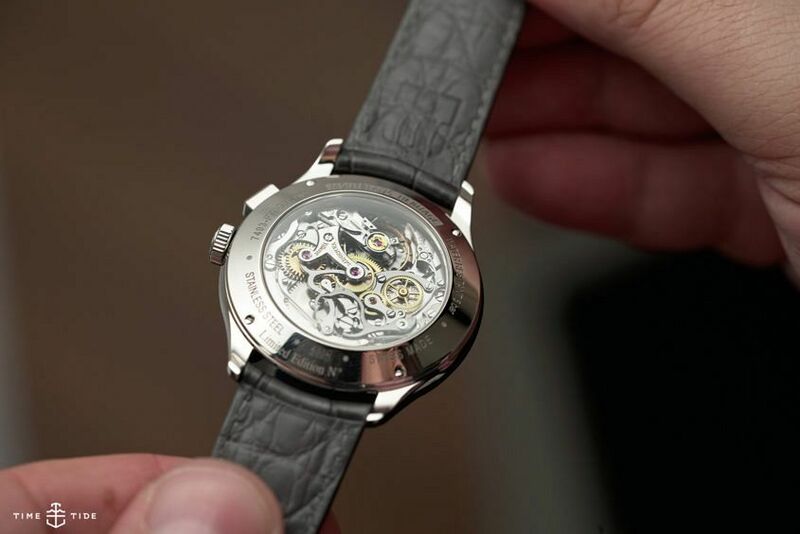 And all of it is done by hand – an extraordinary level of craft for a chronograph priced below 30,000 euro. To those precision-geeks who might argue that a horizontal clutch is less precise than a vertical clutch, Montblanc’s answer is its hairspring, produced in-house at its Villeret (Minerva) manufacture and given a Phillips terminal curve, which improves isochronism. So what’s the downside? Probably it’s this: being limited to an edition of just 100 pieces, the Heritage Pulsograph may prove very hard to get. Mark your diary for June, when it’s due to be delivered.